Deadly diseases easily contracted by your dog are lurking in your environment. Be sure to vaccinate to keep them safe. Diseases such as Parvo Virus, Hepatitis and Distemper can result in your dog becoming severely ill. These diseases are very expensive to treat and can often end in a fatal outcome for your dog. Canine Cough is a nasty respiratory condition, which again, is very expensive to treat. It’s very unpleasant for you and your dog and it’s a disease that can be prevented by vaccination. Why is vaccinating my dog important? Vaccinating your dog will protect them against nasty infectious diseases such as Parvo Virus, Distemper, Hepatitis and Canine Cough. These diseases live in our environment and can easily infect your dog making them very sick and can even result in death. Please call us on 66523455 so that one of our friendly team can help tailor a vaccination program to best suit your needs. When do I vaccinate my dog? Your dog’s first vaccination should be given between 6-8 weeks of age, booster vaccinations are required at 10-12 weeks of age and in some cases another vaccine is due at 16 weeks of age. Then a yearly booster is due for life. A Triennial vaccine is now available to cover Parvo Virus, Distemper & Hepatitis. What is included in a vaccination visit? 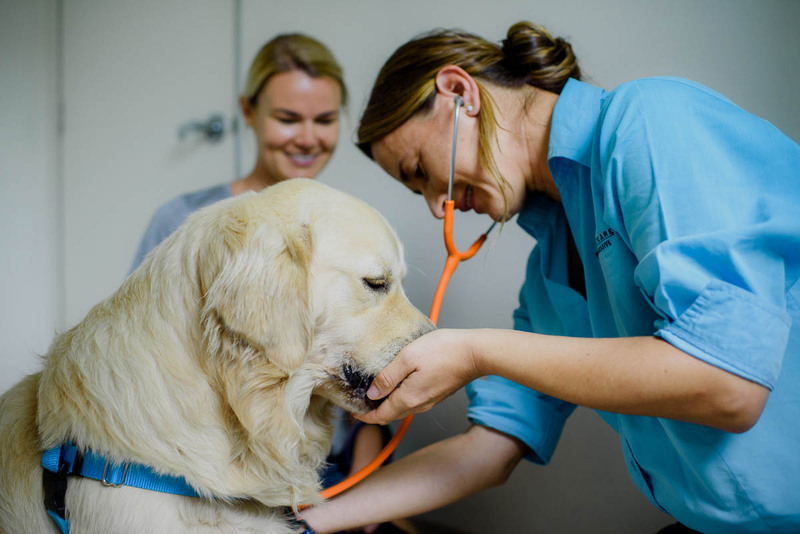 When you bring your dog in for their vaccination appointment our vets will also give them an all over health check which includes examination of; Eyes, Ears, Teeth, Respiratory system, Heart, Joints, Skin and Coat condition. It is also a great opportunity for you to discuss their body weight, exercise levels, dietary requirements and parasite control. Remember that your dog ages much quicker than what you do and on average 1 human year equates to 5 doggie years.